But it is why I never bought a Kindle years ago. Why I don’t now is a different reason. But I do have a Sony T1, which I find just barely useable. Mostly because it’s just a little bit too slow. The ebook landscape has erupted in the last few years something amazing. It has also been part of the story of why so many bookstores have vanished, including the collapse of one of Australia’s biggest book chains. Buying on the Internet has helped in both ways. When you know exactly what book you, going to a website is much faster than finding a bookstore that might have it at best, or having one being able to order it in at worst. Buying ebooks this way, where as soon as the purchase is complete, you can download the file then and there, was a red-hot obvious next step. Despite pressure from basically the rest of the industry, Amazon still will not put ePub support into their Kindle ebook readers. Amazon doesn’t seem to like the rest of the ebook industry existing because they are strongly rumoured to want to be the only place all books, physical or not, are bought and sold. You’ll never hear them say this, of course. But it goes quite a long way to explain the whole Kindle ecosystem they built. 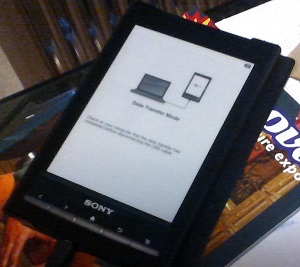 Their ebook reader is not a standalone device: it is tightly integrated with the Amazon ebook delivery mechanism. They spent a lot of time and money making it stupidly easy to purchase Kindle-format ebooks from them. Would that someone else had copied that and figured out how to do it better. Apple could, as they also excel at creating an integrated ecosystem. But they didn’t want to become a publisher. Sony could have, too, but they have a bad habit of dithering around until they can successfully hit their own foot. MiniDisc again. However, it’s obvious they actually know how to do it, because they’ve been pretty successful at it with their Playstation Network. As it happens, I genuinely prefer a physical book, often referred to as “dead tree” edition. But ebooks aren’t going away and there are just enough that I want to read that my T1 was recently exhumed from the shelf it was gathering dust on and recharged for adding new material to. But is it the best choice? I often have my Surface Pro with me nowadays. And people have been reading on iPads and Android tablets for years. Should I go looking for a good ebook reader for my Surface Pro? The one in Calibre is not bad, but it is quirky. Or should I go looking for another e-ink device? The ebook landscape has changed somewhat since I last blogged about it. And yet at the same time not a lot has changed. I don’t buy many ebooks. In fact, I don’t buy many books, but even so, most of my purchases in the last year have still been physical books. Part of the reason is that I’m still getting used to the experience of reading on a device, rather than reading a physical book. The other thing is that I never bought into Amazon’s ebook kingdom. This is where you read ebooks on an Amazon Kindle, you buy ebooks on Amazon’s web site and you forget all about ebooks outside this walled garden. Recent events show why this business model has deep flaws for end-users. There is a bit of a kerfuffle at the moment around the way e-books are priced on retail websites. And this is more than readers complaining about prices that don’t make sense; it is about the US Department of Justice about to accuse several big publishers of pricing collusion. Amazon and Apple and their business practices are at the centre of this. Both companies have the reputation and the ability to create a vision and then implement it. Both companies have the reputation, the ability and the desire to create closed “ecosystems”. Both companies sincerely want to be The Last Word and The Only Place for their technological niche. In Amazon’s case it is books, both on paper and electronic. For Apple, it is personal computing. Including electronic reading.